Firstly, I am a proud ambassador of Girl Rising! This position has put me in the company of a rich tapestry of women from countries all over the world, working in unison on this global campaign for girls’ education. Holly Gordon is Co-founder and CEO of Girl Rising, and Lauren Manning is our fearless, passionate and hands-on Campaign Manager. 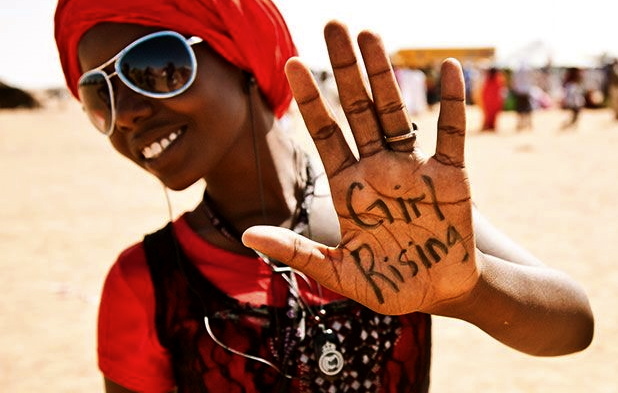 Girl Rising is a movement today, but began as an outstanding documentary. Released in 2013 to international kudos and recognition, the documentary film, directed by Academy Award nominee Richard E. Robbins, tells the story of nine girls from around the world, facing and overcoming hardships in pursuit of their dreams of an education. The young women deal with issues such as arranged marriages, child slavery, gender violence and discrimination. Each girl’s story is written by a renowned writer from her native country and narrated by a celebrated actress. Around the world, millions of girls face obstacles to education that boys do not. The community of Girl Rising, know that educating girls is the smartest investment of our time! When girls are educated, communities prosper and economies grow. And yet there is an estimated 62 million girls missing from classrooms worldwide, and tremendous opportunities are lost. Through film and other tools, such as educational and advocacy videos, Girl Rising is working to raise awareness about the importance of educating girls and changing the way the world values girls. The Girl Rising Fund distributes contributions to their girl-focused programs, providing scholarships and uniforms, building libraries, classrooms, supporting safe-spaces, providing health training, and more. More funding means more girls in school, more economic growth, and a brighter future for us all. You too can join the Girl Rising community as well, and become a champion for girls’ education here. Smitten with everything about Girl Rising! Firstly, I am crazy for this endeavor, this movement: HALF THE SKY. This is an essential watch/study for any and all global citizens. This 10 DVD set was inspired by Pulitzer Prize winning journalists Nicholas Kristof and Sheryl WuDunn's groundbreaking book HALF THE SKY...which takes on the central moral challenge of the 21st century: the oppression of women and girls worldwide. The film follows actress/activists America Ferrera, Diane Lane, Eva Mendes, Meg Ryan, Gabrielle Union and Olivia Wilde, along with Kristof to meet some of the most courageous individuals of our time, who are doing extraordinary work to empower women and girls everywhere. These are challenging, dramatic stories of transformation and hope. You will be shocked and outraged...and ultimately inspired by the resilience of the human spirit. The film leaves us in awe of the capabilities of women and girls to realize their astounding potential. 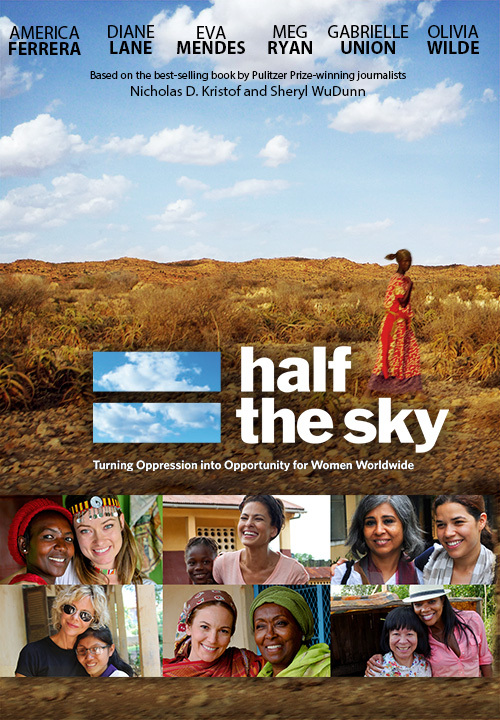 HALF THE SKY is a passionate call, urging us to bear witness to the plight of the world's women, and to help transform their oppression into opportunity. Our future is in the hands of women, everywhere.